On Saturday morning, Brigid (my friend who is the creative genius behind Kokopod) and I set off on a road trip to this year’s Noosa International Food and Wine Festival for a day of eating and food shopping. The festival started back in 2003 as the Celebration of Australian Food & Wine Noosa Style featuring famous foodies including Stephanie Alexander, Matthew Evans, Philip Johnson and Luke Mangan and has since grown to be one of the country’s leading food and wine events, drawing visitors and presenters from across the globe. The four-day annual festival includes a program of events including master classes, degustation dinners, celebrity cooking classes and food trails with more than 200 chefs, producers and winemakers sharing their knowledge and talents with attendees. In 2008, Noosa Food & Wine Festival was named by the Australian’s Travel & Tourism Awards as “one of the best food experiences in the country” and it still lives up to the hype as a chance for foodies from all over the world to celebrate and enjoy the good things in life. Although the skies opened just as we arrived, Brigid and I weren’t to be deterred and set off to try all the free samples we could get our hands on, leaving the Lions Park with bags filled with delicious treats including Pepe Saya butter, Woombye Cheese and award-winning caramel slice from Sweetness the Patisserie. I can’t believe it’s REAL butter … the Pepe Saya stand at Noosa International Food & Wine Festival. Brigid stocking up on goodies from the Sweetness stand. Woombye Cheese … the Triple Cream Brie infused with Italian Truffle is to die for! 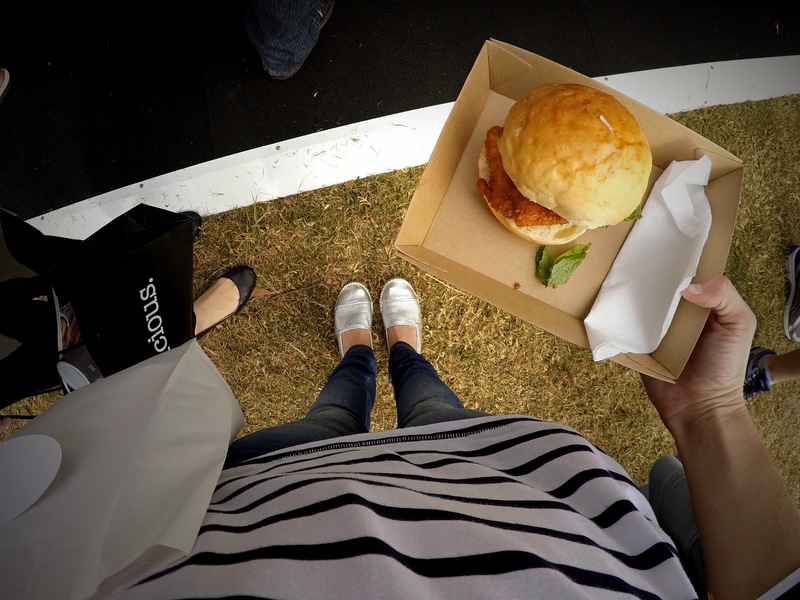 First up … the Southern Fried Chicken burger with celeriac remoulade with hot sauce from Elizabeth Merryment. Agnello . Crispy lamb belly, fennel, pea, pecorino romano and orange salad, mint vinaigrette from Locale Ristorante and Bar. Cajun spiced cihcken ribs with lime aioli from Gaston Bar Bistro. Pig in a picnic blanket with tomato salad by Simon Thomsen. In the end, I pretty much had to undo the button on my jeans because I’d eaten so much food, but it was totally worth it and we’re already planning a weekend away for next year’s festival so we can make the most of the outstanding program of events. It was probably for the best that a few of the stalls ran out of food before we could get to them otherwise I’d have come home 5kg heavier!